The Belleek castle LED light was introduced in 2019. The Belleek Castle Light features pierced windows and an embossed door along with a sculpted parapet roof line and embossed rock walls. The Belleek castle is enhanced with painted shamrocks on both sides along with gold accenting. 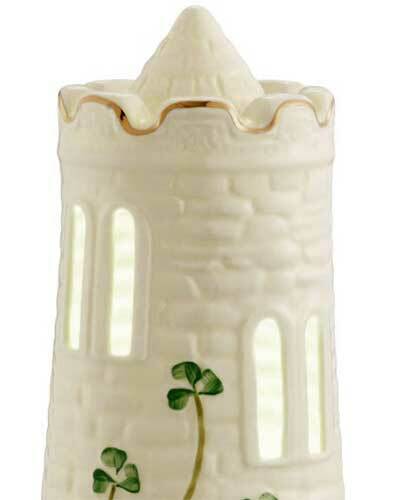 The illuminated Belleek castle is made of fine china and measures 3 3/4" wide x 7 3/4" tall. The replaceable batteries are included. The Belleek China castle is handmade and hand-painted in Belleek, Ireland; it is gift boxed with a shamrock history card, complements of The Irish Gift House. 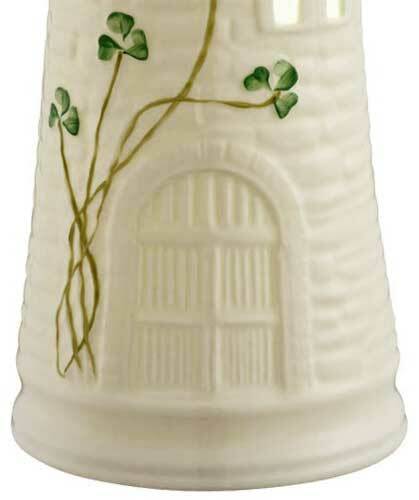 Belleek lamp and shade with its shamrocks and parapets will transform your home into your castle.